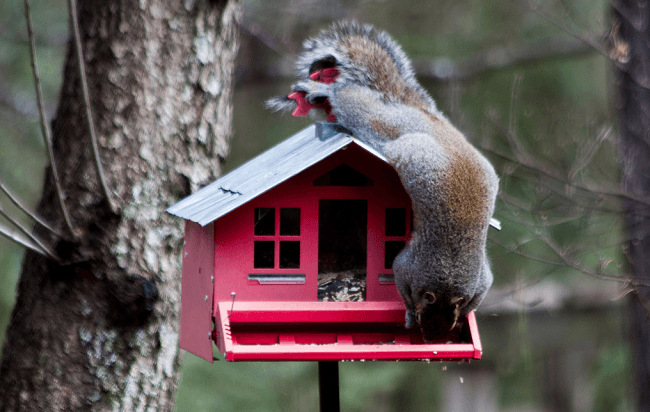 » Do Squirrel Proof Feeders Work? Do Squirrel Proof Feeders Work? Squirrels were once so abundant; they would do such massive migrations it is said the sun would be darkened for days. Even more astonishing, squirrels could make the migration from the east coast to Indiana without ever touching the ground. It wasn’t until settlers began clearing the forests that the squirrel population started to decrease. They were forced on the ground and predators like fox and coyotes were quick to hunt them. The last great massive migration of squirrels was in 1963 in Wisconsin. They were reported to be dying by hundreds as they tried to get across highways and water barriers. Squirrels have not migrated like this since. These little creatures are truly unique, but not everyone shares a welcoming sentiment towards squirrels. When it comes down to a fight between feeding an array of beautiful birds or one furry seed bandit, the ongoing battle can be exhausting. So, do squirrel proof feeders work? While the answer may not seem obvious by the title ‘squirrel proof’, trust that much time and research has been dedicated to this actual problem. Most squirrel proof feeders do deter the little bandits. Some feeders work better than others, yet more efficient designs are being marketed all the time. Much of the other necessary work involves creating an environment a squirrel cannot maneuver in. For example, if your bird feeder is close to many squirrel launching platforms, they are going to take great advantage of this. Squirrels love fences, trees, rooftops, and anything else their agile little bodies can spring from. Another area is examining the bird feeder material. Squirrels are notorious for their chewing, and will chew a good-tasting feeder to bits. Consider using a feeder made of an indestructible material like Lexan. Squirrel proof feeders which work well are made with reinforced metal and contain small seed ports. Add to this a counterweighted door that will close automatically when something heavier steps on the platform and you have an excellent squirrel proof system. There are several great brands on the market. While many of them may not be the most eye-catching feeders around, they do an exceptional job at shushing away squirrels. To combat a squirrel problem with your bird feeder, search for a tube feeder style which is mounted on a pole with a large baffle. Baffles can also play double-duty purposes when fastened underneath the bird feeder, catching all the spilled seed. 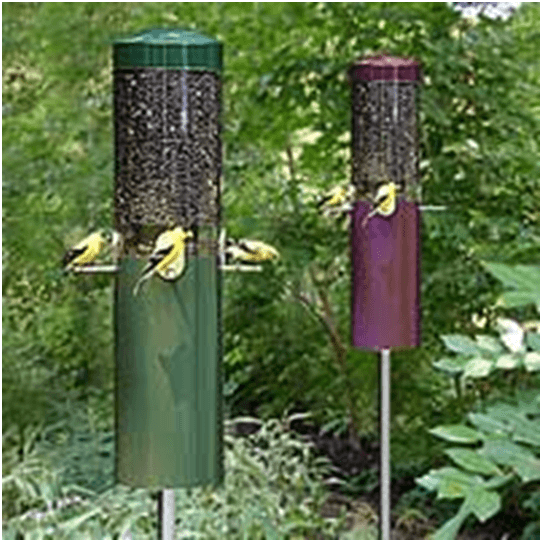 If you remain uncertain about the best squirrel proof bird feeders, this Nature Products 431 Green Classic Pole Mount Wild Bird Feeder is ideal and efficient for warding off pesky squirrels. It may not be the most attractive bird feeder, but it has been proven to provide superior deterrent measures. A squirrel may be able to launch yet unable to land and stick around. Endorsed by the National Audubon Society, this patented design was created by Birds Choice. 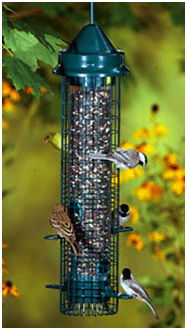 The bird feeder is made with UV resistant Lexan, has aluminum feeding ports and stainless steel perches. Also inside this bird feeder is a plexi-glass ring to provide additional weather protection. It will hold up to 5 lbs. of seed inside a see-through feeding natural colored case. If you are serious about your bird feeders, then at only $55.99 this will be the absolute best one to invest in. Another great product is marketed by a top quality company called Brome. They have created a series of effective squirrel proof feeders. This particular one, the Brome Squirrel Buster Classic has been patented with Squirrel Buster technology, an innovative design which allows for automatic mechanisms to close when a squirrel or anything heavy climbs onto the feeder. Even better, the feeder has a negative grip tube which makes it difficult for squirrels to grab with their legs and hang down while they try to defeat the closing mechanism. It will hold up 1.4 quarts of bird seed. This brand markets for only $51.98. Brome carries a select variety of squirrel proof feeders. Some people like one over the other, however most will agree these truly are squirrel proof feeders that get the job done. If squirrels are selfishly eating up all your bird seed in competition with your lovely birds, here are the feeders that will save the day. What is The Squirrel Breeding Season? Is Infant Dehydration in a Squirrel Possible?